The scary Chinese curing salt with the label whose ingredients simply read "curing salts" did the trick. I unwrapped my pancetta today, a day early because I couldn't wait, and sliced into it. It was a rosy pink, and boy was I proud. Three of us tucked into bowls of creamy, fatty spaghetti carbonara with no thoughts of death or dying, although death by spaghetti carbonara would be a worthy way to go. Tomorrow, I am going to use some more pancetta and saute it with shredded Brussels sprouts. I see more cured meat in my future. It looks gorgeous! Well done! dude, that turned out awesome! and death by carbonara sounds delicious. can't wait to hear about the brussel sprouts--i never thought to shred them but i like the idea. do you use a food processor for that? 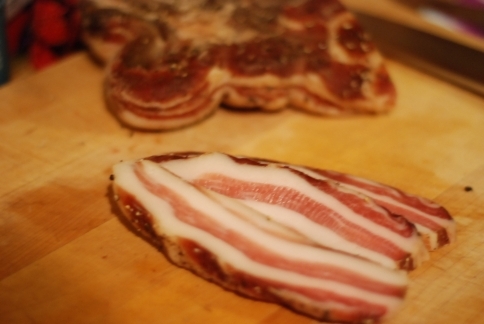 I've been following your pancetta progress and I'm glad to hear you're still alive. Foodycat, thank you! Your charcuterie-making was such an inspiration. kimchi, yes, I use the food processor. Once the Brussels sprouts are shredded, they cook up really fast. Andrea, I'm glad I'm alive, too! It's been a day now, and I feel fine. Can't stop dreaming of a big bowl of spaghetti carbonara now. Need to whip some up on the next rainy day. Mejdool dates stuffed with mild goat cheese, wrapped with pancetta, and quick broiled to a crisp. You are a culinary genius!